The NCAA’s punishment for Penn State gives the university the chance to rebuild and reestablish its reputation for academics and athletics. The NCAA’s punishment is for the best. The school can prove it is a university, not a football program. Some important things happened today at Pennsylvania State University. A nurse treated a broken bone at the medical campus in Hershey. A student learned how to use differential equations in a classroom in Erie. In the Paterno Library, the center of the University Park campus in State College, a librarian helped a student do research for a history paper. Meanwhile, over in Indianapolis, NCAA President Mark Emmert announced punitive measures against Penn State’s football program in the wake of the devastating accounts of malfeasance by university leaders and coach Joe Paterno in dealing with revelations that former defensive coordinator Jerry Sandusky had raped children for years—sometimes in the school’s athletic facilities. Emmert fined the university $60 million, banned it from postseason play for four years, cut the number of football scholarships it may offer, and vacated all wins since 1998, when Paterno first learned of Sandusky’s crimes. The NCAA penalties could have been worse. The program could have suffered the “death penalty,” the cancellation of the entire football program for a number of years. That’s happened to just one other football team. Southern Methodist University committed such egregious recruiting and player-paying violations in the 1980s that the NCAA zapped its storied and successful football program for 1987 season. The program has never recovered. But SMU has. That’s because a university does not have to be its football team and vice-versa. The Paterno family is upset about the way that the revered coach, who died on Jan. 22, became the object of derision almost instantly in the wake of the report by former FBI Louis Freeh. The Freeh report took Paterno to task for failing to alert law enforcement about Sandusky’s crimes and colluding with the athletic director, a vice president, and President Graham Spanier to cover up the crimes. None of these adults exhibited any overt concern for the children Sandusky hurt, at least according to the evidence Freeh outlined in the report. Emily Bazelon agrees that the NCAA is punishing “past, present, and future students ” with its decision today. “The NCAA is coming down not on the individual wrongdoers, but on every Penn State fan,” she wrote on Slate today. But did the NCAA really punish all these students and alums through its sanctions? Not at all. Having to watch bad football for 10 years (the amount of time it’ll probably take the Penn State program to recover and recruit another top team) is hardly hardship. They do get to attend one of the greatest universities in the world, one that serves 94,000 students across 24 campuses. That ain’t nothing. In fact, I would bet every young person struggling to get into an overenrolled math class at Miami Dade College (161,000 students, with many thousands more left out for lack of funding) would gladly trade places with any Penn State student who feels unfairly punished by these sanctions. This punishment is the best thing that could have happened to Penn State. Well, it’s the second best. The best thing would have been for the NCAA to issue a death penalty and for Emmert to avoid grandstanding about how his organization was concerned that programs like Penn State were “too big to fail” and that “these events should serve as a call to every single school and athletics department to take an honest look at its campus environment and eradicate the ‘sports are king’ mind-set that can so dramatically cloud the judgment of educators.” No one takes Emmert seriously when he claims to represent the values of education over athletics. But still, the entire Penn State community has the opportunity to live up to that ideal now. Penn State is a university, not a football program. In 1989, the NCAA handed the University of Oklahoma a series of sanctions for recruiting violations and a general culture of mismanagement led by coach Barry Switzer. The big news that precipitated those sanctions included a star player being arrested while trying to sell cocaine to an undercover FBI agent. Five years later, the university hired former Sen. David Boren to be its president. Since then, Oklahoma has grown in stature as a major research university. Along the way, the football team came back to prominence, winning a national championship in 2000. As a Texas Longhorn, it’s not easy for me to say nice things about the University of Oklahoma. But those 1989 sanctions helped the university right itself and focus on rebuilding its academic and athletic reputations. Everyone who has graduated from Oklahoma since 1989 should be grateful. Penn State is in a much stronger position than either SMU or Oklahoma was. It does not have to work that hard to convince people that it is a top-flight academic institution. In fact, for all his deep moral failings, Paterno consistently supported the university’s academic mission with his own money. And he boasted about the character of his players. Alabama worships Bear Bryant for his wins. Pennsylvania admired Paterno for his values—until recently. Most importantly, Penn State’s presence across the state offers it daily and powerful evidence of the service it provides and the lives it improves. As I have argued before, we Americans take these institutions for granted. We make them scramble for funds and recognition through outlets such as football that have the ability to corrupt. Football need not corrupt a university. It can be one of the best ways to connect alumni and the community to the institution. And, in rare cases such as Penn State, Texas, and Oklahoma, football can make money for a university. Keeping football in perspective, recognizing that universities exploit student athletes horribly, and avoiding the unhealthy adoration that some coaches receive is not easy. The temptations of corruption are great. But at least at Penn State University, for the next decade or so, the community is relieved of that temptation. 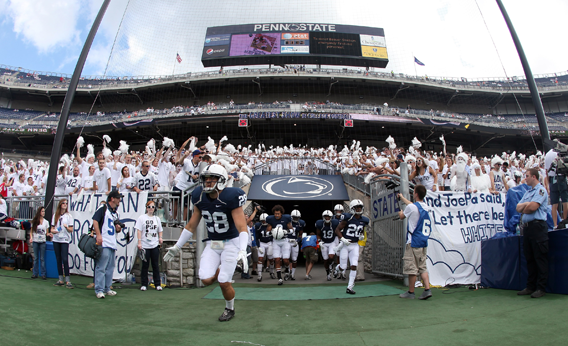 Penn State football can start over and serve as a model program, without the unhealthy cult of personality. In the mean time, Penn State alumni, students, faculty, and leadership will just have to boast about what happens in the labs, libraries, and classrooms.